He came in the morning when they were still making lunches and getting ready for school and work. He killed them all. Mother, father, children. Brutally slaughtered them in the comfort of their own home. They called him the Monday Morning Killer. That was forty years ago, but now it is happening again. A mother and her daughter are brutally murdered in their own home, on a peaceful Monday morning in Cocoa Beach, Florida. Home alone with six children while his wife – country superstar Shannon King – is on tour, Detective Jack Ryder gets the most terrifying case of his career, chasing a deranged serial killer, unlike anyone he has ever seen. No one feels safe, especially not the girl next door, who just bought the house where the first family was killed forty years ago. Who is capable of such cruelty? And why? Could one person be responsible for these brutal killings of entire families so many years apart? Or is Jack dealing with a copy-cat? You’ll never guess the shocking answer. 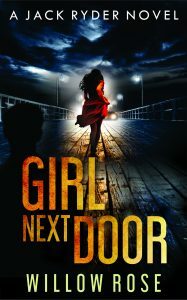 With intense twists and nerve-wracking tension, GIRL NEXT DOOR is Willow Rose at her most chilling and horrifying. This is precisely the type of book that earned her the nickname the Queen of Scream. GIRL NEXT DOOR is the fifth book in Willow Rose’s popular Jack Ryder series but can be read as a standalone.